Donald Trump has warned that 'North Korea is looking for trouble', insisting that if China 'does not decide to help', the US 'will solve the problem without them'. 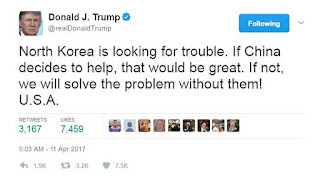 The US President wrote the message on Twitter after revealing he had urged his Chinese counterpart Xi Jinping to pressure Pyongyang in to stopping its nuclear programme. 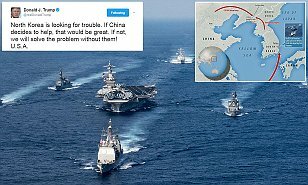 His warning came as Russia admitted it is 'extremely worried' the US will attack Kim Jong-Un after North Korea warned it has US bases 'in its nuclear sights'. Pyongyang had earlier threatened 'catastrophic consequences' after Donald Trump sent an armada of warships to the Korean Peninsula. At the same time, China has moved 150,000 troops to its border to deal with a possible influx of North Korean refugees amid fears Trump may strike Kim Jong-un following the surprise US missile attack on Syria last week. It comes as G7 nations insisted Bashar al-Assad must step down as part of any peace solution in war-torn Syria and as US Secretary of State Rex Tillerson declared it was clear that the 'reign of the Assad family is coming to an end'.